Selecting a good 5-cup coffee maker from the large selection in the market in 2018. can be confusing. Apart from the capacity of the machine, you should consider the reputation of the manufacturer, the quality of coffee produced, price, durability, ease of use and the brewing speed. Below are some of the best 5 cup coffee makers based on these factors. Read our reviews. The designers of this model of Zutto 5-cupper had versatility and aestheticism in mind. Its water reservoir is removable, a feature which is not common with most coffee makers. Therefore, you can detach it from the coffee maker to fetch water from the sink or to wash it. The reservoir also has clear graduation marks to help in making accurate measurements of water. The coffee maker boasts of a removable water filter to ensure that you get the best quality coffee. The device has an appealing exterior which makes it a perfect option for your home kitchen or office. The coffee maker first purifies the water you put. Therefore, it brews top quality coffee with the best taste. The taste primarily relies on the quality of the coffee you have. 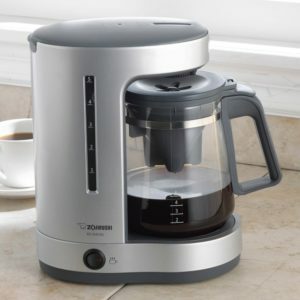 Based on the functionality of the coffee maker, this Zutto model gives you reasonable value for your money. The machine is well-designed with no known flaws. It maintains high functionality standards for years. It is very easy to use the device. The Zutto 5-cup has only one switch. To make coffee with the machine, add coffee to the conical paper filter, pour water into the reservoir and flip the switch. That’s all. Its removable parts make cleaning of the device easy and thorough. The machine offers a range of 3-8 minutes to get your coffee ready. The completion time obviously depends on the number of cups you want to prepare. With an average of 5 minutes speed, the machine is amongst the fastest coffee makers. Zojirushi EC-DAC50 Zutto 5-Cup Drip Coffee maker is the solution when you want a beautiful machine which brews high-quality coffee quickly. Black & Decker DCM600B 5-Cup Coffee Maker looks so nice. it has the removable water reservoir, isn’t it?